(Above) The Dog Run Area. You can see Shayna sniffing around at the base of the tree. We brought our doggy Shayna to the dog run area at Pet Movers at 4 Pasir Ris Farmway II to let her run about and explore within a safe confined area. Pet Movers have an enclosed field that is open to dog owners to let their dogs run about and interact with other dogs. You can see me running with Shayna. She was so happy wagging her tail and running until her tongue hanged out! We reached there at opening time which is 9.30am on weekends to avoid the crowds which usually come later and also this would give her more empty space tp run about before the number of dogs arriving increased. Initially, she was very cautious and was hesistant in moving around but her curiosity soon got the better of her. Soon she was just running around and trying up to pick up new scents. We noticed that Shayna was more curious about people than other doggies and being a 'kapoh' doggy as always followed people around but when we start moving away, she knows how to come back and keep pace with us. (Above) The kaypoh doggy smelling everything ! What's that! Hey Shayna! keep away from another doggy's wee wee. She has become nowadays more attached to myself and Gayle. For those who are interested, they also have a dog wading pool and a small snack stall for drinks and finger food. If you want to find a car park lot, do come earlier. Recently, we purchased a Garmin nuvi255w GPS navigator for our car to ease our search for new places that we have to drive to, especially those in the west and north. Installing a OEM Mercedes GPS would have cost us an exorbitant sum of 10k which is really not worth it. This unit has a 480 x 272 pixels WQVGA color TFT with white backlight screen that provides crisp and sharp images even in strong daylight. It is quite lightweight weighing 147.42 g and the rechargeable lithium-ion battery can last for up to 4 hours. It has customizable features such as adding photos to depict your favourite places on the map. An easy feature which I like is the Where Am I feature which allows me to record our favorite makan places which are not found in the standard list of main shopping belts etc. Like all new GPS, it allows you to decide whether you want to go by the fastest route or by the shortest route which may not be necessarily faster. After using this GPS, we found that it's main use would be to guide you to places that you never been to. For places that you already know how to get to, using a GPS could be slower and also you have to drive slower since the GPS distance calculator updates may be slower than your pace if you drive too fast and you may end up missing a turn. However, the nuvi will automatically plot a new route to get back on track if you do miss a turn. The touchscreen and easy interface makes it a breeze to use although the typing may be a challenge on the touchscreen QWERTY keyboard if you have broad fingers or if you do not have enough elbow space due to the placement of your GPS in your car so you may want to try out a comfortable position to locate in your car for you to type comfortably. (Above) We mounted it on our dashboard with the external wiring concealed into the dashboard. 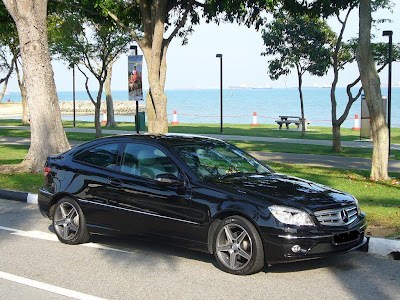 We purchased and fitted our Garmin Nuvi GPS at Pin Liang Enterprise for $428 promotion inclusive of a desktop charger, SingMal maps, external leather casing and internal wiring to the car battery so that there is no unsightly external wire attachment to the car AV point. While they may not be the cheapest, Pin Liang does do a good job with it's installation based on our previous experiences. 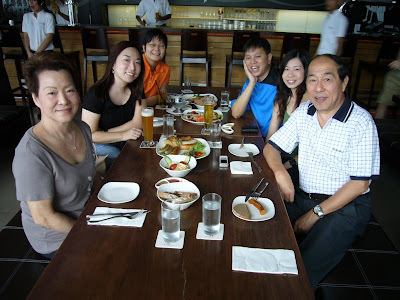 As it was father's day and our dad's birthday over the weekend, Gayle's sister and us took dad and mom to Brotzeit for some German fare for lunch. Gayle's sister's friend also joined us. It's always good to go in with an empty stomach so that you can truly salivate over the generous portions. At the same of course, pair your meal with some good German beer. We ordered the first dish of a Würstelplatteauthentic sausage platter(below) with spicy chicken sausage, lamb sausage, mini pork cheese sausages, weisswurst sausage and garlic sausage with sauerkraut. The sausages were meaty and frangrant, one bite into it and you can just feel the minced meat inside releasing the aromas of the herbs, cheese and spices. To me, this was a scaled up version of our traditional luncheon meat but of course,much more fragrant and freshly minced. The creamed spinach was a good complement to the meat. To add some salad to this meaty combination, we ordered the Obatzdatypical Bavarian crème cheese(above) served with onions, cucumbers and tomatoes alongside a basket of selected German breads(below). For those who are into cheese, this will be heavenly to you. But non cheese lovers can also appreciate this dish as it is not too overpowering. To round up the meal, Gayle's sister and friend ordered three desserts to share. The first was Brotzeit's signature dessert known as the Chef's creation (below), a connoction of homemade vanilla ice cream drizzled with pumpkin seed oil topped with almond flakes. A unique combination which is quite refreshing and the sweetness of the ice cream blends well with the fragrance of the pumpkin seed oil. Second dessert of the day was the Kaiserschmarren shredded pancake(above) with rum and raisins served with plum sauce(below) on the side. This is quite a rich dessert so it's good to share. Of course, we also ordered beers and apple juices to finish off the meal. Indeed a delicious and well spread meal with beers and well worth the price which came to about 28+ a person. There is also a 10% discount on food only offered by Citibank, AMEX and UOB. For their menu and prices, you can visit http://www.brotzeit1516.com/menu.html. It's been two months since we had our Merz CLC. Some people have been asking us about the quality of the car, what with urban legends of the reliability of continental cars. It has been a pleasurable drive in the car so far with no problems so far other than a squeaking sound from the rear suspension when we go over humps. Will be going to the service centre for a check in a week's time. The 5 speed auto car is really built for cruising rather than bruising. Definitely it can't outrun an evo,rx 8 or wrx but then, the clc is intended for one who drives for pleasure and comfort rather than for speed. However, a 0 - 100km/h of 9.8 sec plus the boost of the kompressor unit does help for quick overtaking and merging from a slip road into a main road, what with Singaporean drivers always speeding up the minute you indicate you want to merge in. The car feels solid and heavy and that gives me the confidence to steer into a tight corner. This cornering ability and confidence is aided by the direct steering rack sourced from the SLK and the speed sensitive steering which allows you to steer with a flick of your wrist at higher speeds. This can also be attributed to the firm suspension of the car although it doesn't do too well over potholes which may lead to a bumpy ride but potholes are few and can be avoided with careful driving. Petrol consumption of course can't really match up with the fuel efficient japanese cars with consumption between 11l/100km to 10l/100km for urban start stop driving conditions. The CLC revels in cruising along the expressway where fuel consumption improves to about 8.3l/100km on average. The usual luxury amenities are present in this car - auto headlights , auto wipers, return home courtesy lights, front and rear fog lights, Speedtronic cruise control and variable speed limiter, headlamp adjustment, seat belt warning indicator, electrical operated wing mirrors with LED indicators plsus high brilliance clear headlamps. The seats are comfortable and huge although thigh support could be better. I intend to change the artico fabric central portion of the fabric and leather seat to full leather once the fabric gets older and worn out. The light grey leather interior does require more maintenance since stains can get seen more easily than a darker coloured interior. As the CLC is a coupe with a low stance, driving the car needs some getting used to. I don't know if it's something to do with growing older but i had waist ache the first few weeks of getting in and out of the low slung CLC but i have since recovered. Could probably have stretched some muscles. It could also be due to the high seating of my previous 'i' . The low stance of the CLC also means that I must watch out for kerbs especially driving head into a carpark lot so now i reverse park instead. Just did a minor respray at ADSM(Advanced scratchmaster) for some scuffs at the bottom of my bumper which cost me $80. If you need a good paintjob at a reasonable price,do try them out. Fast reliable and quality service.http://www.adsm.com.sg/why.php . Driving the CLC also needs some getting used to as the sloping roofline and the angle of the rear window makes rear view visibility a challenging proposition(below), especially when changing lanes or reversing. The 4 point reverse sensor with parking distance indicator helps a fair bit in reversing. allowing the front seats to move forward is useful allowing for more entry space into the rear seats. However, passengers will have to get used to getting in and out of a low slung coupe like the CLC. The 6 CD changer is built into the main console and is easy to use with Windows type of scrolling interface. Of use too is the Bluetooth handsfree function that allows me to receive and make calls from the car instead of reaching for my phone. A unique feature is that the main console display lights up automatically when the car is in a brighter area and darkens when the car is in a darker area to reduce glare. The leather bound steering provides a good and secure grip when steering and its three spoke design lends an air of sportiness. 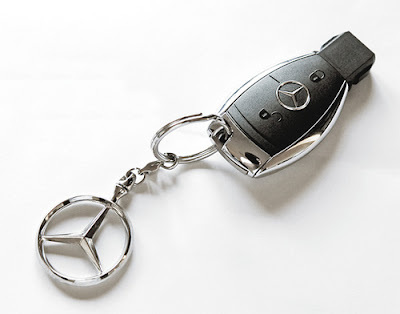 The steering wheel of the CLC was sourced from it's bigger cousin - the CLS. The dials of the dash have chrome trimmings to add a touch of class and what is useful is the digital display readout of the speedometer which allows me to have a quick grasp of the car's speed, which is something i find very useful as it helps me keep speed in mind since the car is so stable and quiet that I am not aware that I have busted the speed limit already often. The boot is quite large and more than adequate for our use. No problems fitting in a baby stroller or golf clubs into the boot and if you push down the rear seat, the boot space extends to 1100 litres. There has been alot of criticism from car journalists about the older look of the CLC interior which I don't quite understand. Actually, i quite like the traditional look of the clc interior with man made leather trim on the surrounds and glove compartment and door trimmings, grey bird eye maple wood inserts. It really has that Mercedes identity which in my personal opinion is abit lacking in the new c class range. I guess I am a purist at heart. Sure the new c class sedan have the angular architecture which is the modern in thing today in many modern cars as compared to the more dated rounded architecture of the clc interior but the vast amounts of black plastic and faux aluminium trimmings in the new c class sedan just doesnt make the new c class sedan any different from a VW golf which speaks volumes about the quality of the golf's interior. In fact, the new Audi A4 interior beats the competition hands down . I also like the two tone black and light grey colour combination of the interior also helps make the CLC looks more luxurious.